Seventy percent of Americans oppose cuts to Medicare and 57 percent are against cutting Medicaid, even when they are aware that the programs constitute an outsized weight in the federal deficit. Of the two wildly popular programs, Medicaid is the most vulnerable. It’s a little-known fact that Medicaid covers more people than Medicare. In 2010, according to the Department of Health and Human Services, Medicaid covered 53.9 million people, compared with Medicare’s 47.3 million. Additionally, Medicaid patients are also among society’s most vulnerable. “Kids (and) pregnant women are the vast majority,” according to Health and Human Services Secretary Kathleen Sebelius. “But then older seniors, many of whom are in nursing homes…and very disabled individuals” are also covered by Medicaid. Although states and the federal government share the cost of Medicaid, what grates on some governors is the rules that come with the money. “Governors just want flexibility to run our states,” said Republican New Jersey Governor Chris Christie at the annual National Governors Association meeting in February. “We don’t want to pay 50 percent of the cost of Medicaid and have zero percent of the authority. And I don’t think that’s an unreasonable thing to be asking for.” Governor Haley Barbour of Mississippi agrees. “If I could get total flexibility, I would take a two percent cap in a heartbeat,” he said. Barbour’s preference is to receive a lump sum – what it gets now from the federal government, plus two percent to fund Medicaid. Dr. Donald Berwick, administrator of the Center for Medicare and Medicaid Services, (CMS) said “There’s a right way to reform Medicare and a wrong way,” Berwick believes that the direction he is taking — modeled on his successful patient safety campaigns at the Institute for Healthcare Improvement – will bring about needed healthcare change. The Obama administration’s efforts to improve patient safety are more or less bipartisan. There is little cause to dispute CMS’ data: the agency spent $4.4 billion in 2009 caring for patients harmed in hospitals and an additional $26 billion on patients who were readmitted within 30 days. The Partnership for Patients, funded through the Patient Protection and Affordable Care Act (ACA), seeks to reduce preventable injuries by 40 percent and cut hospital readmissions by 20 percent in just two years. According to CMS, achieving the Partnership’s goals will result in 1.8 million fewer patient injuries, allow more than 1.6 million patients to recover complication-free and save up to $35 billion in health costs. Department of Health and Human Services (HHS) Secretary Kathleen Sebelius described contentious portions of the ACA as the inaugural steps toward entitlement reform. Sebelius criticized proposals to transform federal Medicaid funding into block grants for states. When some lawmakers asked her to speak about the Obama administration’s alternative proposal to rein in entitlement spending, Sebelius pointed to two provisions of the new law. The ACA created a new board of independent experts that will recommend Medicare payment cuts. Its recommendations will take effect automatically unless Congress blocks them — and proposes equivalent savings. According to Sebelius, the panel represents “a big step in terms of entitlement reform that actually doesn’t potentially cause harm to our seniors.” She also pointed to an HHS effort to create new methods of dealing with people who are eligible for both Medicare and Medicaid because those patients represent a lopsided share of the programs’ costs. With the power shift in the House of Representatives, Medicare, Medicaid and Social Security are being targeted in proposed budget cuts designed to bring down the deficit. “It will likely be the first time you see a House have a prescription for Social Security, Medicare and Medicaid,” House Majority Leader Eric Cantor (R-VA) said at the Federation of American Hospitals’ annual public policy conference and business exposition in Washington. Mississippi Governor Haley Barbour, a Republican, said that members of Mississippi’s Medicaid program saw its enrollment drop approximately 23 percent to 580,000 beneficiaries from 750,000 after the state started requiring beneficiaries to establish their eligibility in person. Barbour began this practice in his first year as governor in 2004. Senator Orrin Hatch (R-UT), the ranking Republican on the Senate Finance Committee, slammed the Patient Protection and Affordable Care Act (ACA), noting that its expansion of Medicaid will “bankrupt” the states, which already have strained budgets. Hatch also cited Congressional Budget Office figures that say the ACA’s Medicaid expansion will cost taxpayers $435 billion over the next decade. 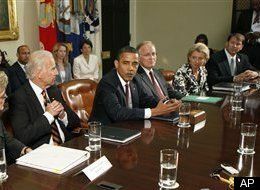 The president endorsed the proposal to allow states to apply for “innovation waivers” beginning in 2014, three years earlier than originally scheduled. Under the terms of these waivers, states would be exempt from several of the law’s requirements if they set up their own method of adequately expanding coverage. The “individual mandate” is the focus of multiple state lawsuits by states that contend it is unconstitutional. The Obama administration has posted a detailed fact sheet on the proposal on the White House website. Additionally, Department of Health and Human Services (HHS) Secretary Kathleen Sebelius has blogged about it. Despite lingering opposition to the healthcare reform law, the Obama administration is moving ahead with its implementation. Over the last 10 months, HHS has made $2.8 billion available to states to help them start reforming their healthcare systems. These funds let the states invest in improvements. These investments are showing signs of progress thanks to more comprehensive oversight of insurance premium increases, new rights and protections for consumers, additional choices for people living with medical conditions, and the elimination of some of the worst insurance industry practices. President Obama also made it clear that the federal government is moving forward with healthcare reform. “I am not open to refighting the battles of the past two years or undoing the progress that we have made, but I am willing to work with anyone, governors or members of Congress, to make this law better…and fix what needs fixing,” Obama said.